This post provides some help in changing the starter in a GM's 2.4L quad four engine found in many cars made between 1996 and 2002. There are some special challenges to this job that will be detailed in this article. This engine is found in such models as the Pontiac Grand Am and Sunfire, Chevrolet Cavalier and Malibu, Oldsmobile Achieva and Alero and the Buick Skylark. Shown is a 1997 Pontiac Grand Am. Note: If only the solenoid is bad, a replacement is available. See the end of the post for parts. Tools: Floor or other jack, jack stands or wood supports, 8,10,13 and 15mm sockets and ratchet, screwdriver, oil filter wrench, oil catch pan. This starter is rather accessible and is removed from the top, but there are several obstructions that need to be dealt with. The oil filter and the crankshaft position sensor are right behind the starter. Jacking the car up and putting it on stands will greatly help removal. 2) Jack up the front of the car and set down on stands. 3) Remove the air intake assembly from the air filter to the throttle body. There are two 10mm bolts and two hose clamps to loosen with a screwdriver. Lift it out and set it back and out of the way, with the wiring still connected. 4) Remove the cooling fan. Disconnect the wiring harness and unbolt the top 13mm fastener. Now pull the fan up and out, tilting it to get around hoses. 5) From underneath, set down a catch pan and with a filter wrench unscrew and remove the oil filter. Set aside. 6) Optional but recommended: unplug the crankshaft position sensor. 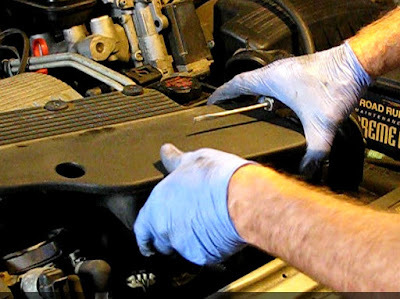 It is easy to catch on as the starter is removed, risking damaging the wiring or sensor. Under view. 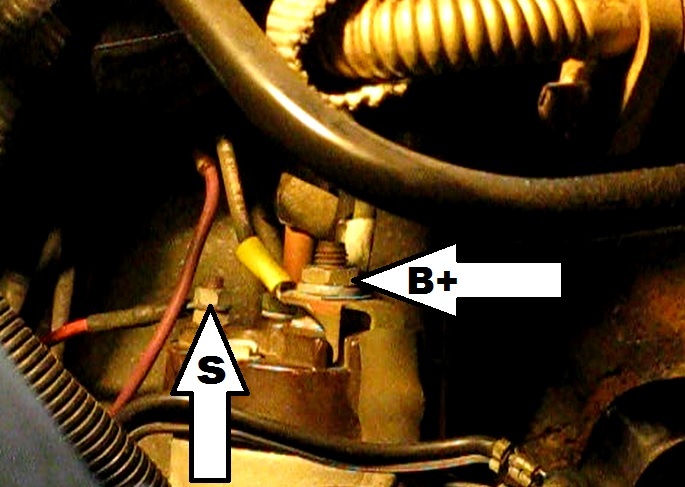 It is a good idea to unplug the fuel pump cut-off oil pressure switch. 7) Break the top bolt loose with a 15mm socket and 1/2" ratchet. 8) Break the lower bolt loose with a 15mm socket, a universal adapter and a 3/8" ratchet. 9) Remove the lower bolt completely. 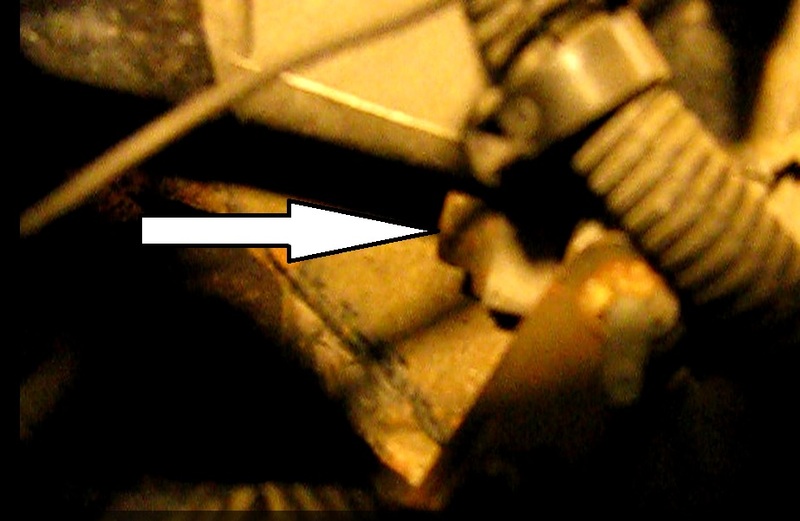 10) Remove the upper, longer bolt with one hand under the starter to take the weight off during removal. The starter will not fall out. 11) Pull the starter out of the bell housing by turning the solenoid toward you and carefully moving it back. This is where care must be taken to not disturb the switch or wiring behind the starter. Rest the starter at an angle, nose end down on the lower car frame below the radiator. 12) Unwire the 8mm solenoid control wire. 13) Unwire the 13mm battery plus (B+) wire. There are two other wires also mounted onto the same stud. Remember where they go for rewiring. 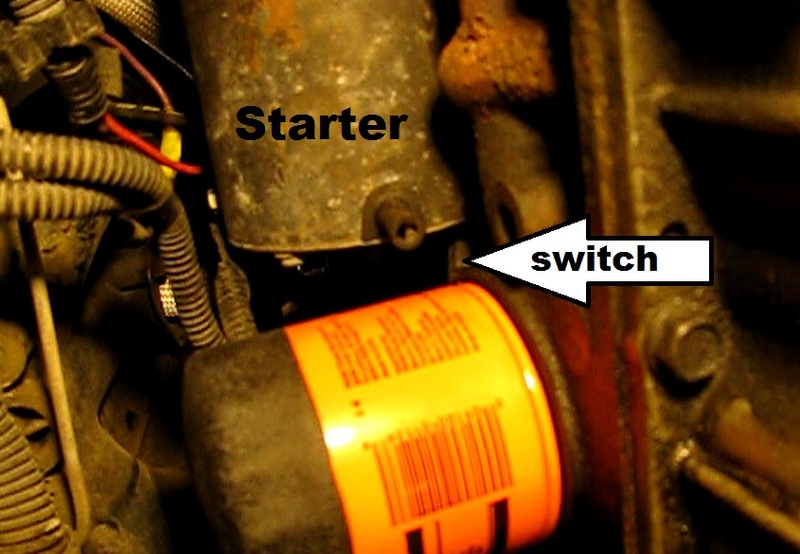 14) Pull the starter out of the car between the radiator the wiring harness. 1) Place the starter in position, resting nose end down, where it can be wired up. 2) Wire up the correct wires to the B+ stud with the 13mm nut. 3) Wire up the solenoid control wire to the small stud with the 8mm nut. 4) Carefully mount the starter in the housing opening. It may be helpful to do this from underneath where the wiring to the oil pressure switch is more visible. 5) Turn in the top longer 15mm bolt finger tight while holding the starter from underneath. 6) Turn the lower 15mm bolt in finger tight. 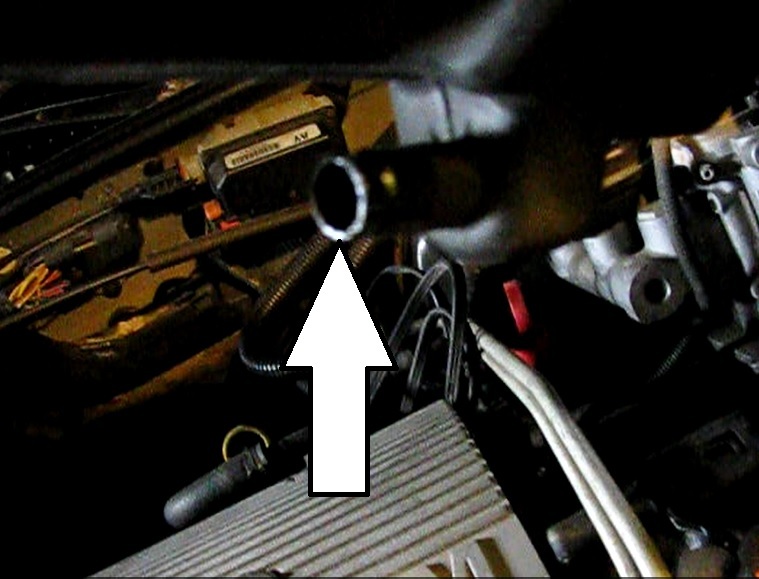 7) Plug in the fuel pump/oil pressure switch if unplugged. The car will not start with this switch unplugged. 8) Spin the oil filter back in hand tight. 9) Install the cooling fan. 10) Install the air intake assembly. Make sure to reconnect the small hose to the underside. 11) Wire up the battery. Mine had three wires going to the large B+ stud. (check out the picture above on the blog). There were two smaller black ones and the large one going to the battery. The small red wire on mine went to the solenoid terminal. I had no wires going to ground. The mounting bolts ground the starter. I know you posted two days ago and are probably finished by now but if not I hope this helps.